The fifth edition has been fully revised and updated throughout, with new case studies, figures, and online resources such as downloadable figures and tables from the text and multiple choice questions for students, accessible at: www.routledge.com/cw/middleton. New topics covered in extended boxed case studies include payment for environmental services, ocean acidification, biofuels in Brazil, waste reduction through industrial symbiosis, and the long-term impact of natural disasters on vulnerable groups. Other approaches and concepts covered for the first time in this new edition include traditional ecological knowledge, environmental justice, the ‘resource curse’, and urban biodiversity. Eighteen chapters on key issues follow three initial chapters which outline the background contexts of the physical and human environments and the concept of sustainable development. Each chapter provides historical context for key issues, outlines why they have arisen, and highlights areas of controversy and uncertainty to appraise how issues can be resolved both technically and in political and economic frameworks. Each chapter also contains an updated critical guide to further reading and websites, as well as discussion points and essay questions. The text can be read in its entirety or individual chapters adopted as standalone reading. The Global Casino is an essential resource for students of the environment, geography, earth sciences and development studies. It provides comprehensive and inspirational coverage of all the major global environmental issues of the day in a style that is clear and critical. 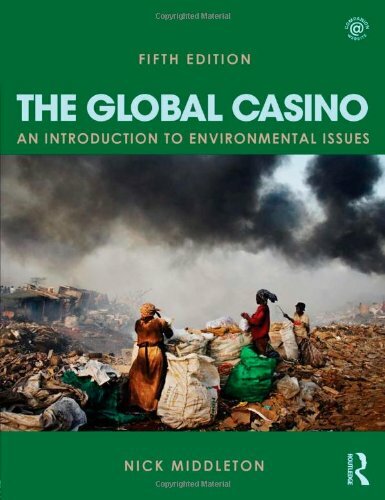 "The Global Casino Fifth Edition provides a solid foundation for understanding the human impacts on a comprehensive array of environments, resulting from a wide range of human activities. With its updated literature and revisions, it will continue to be a valuable text for courses in environmental studies and geography, providing the basis for well-informed discussion and analysis." Dr Wolfgang Hoeschele, School of Environmental Studies, Truman State University, USA. Nick Middleton is a Fellow and Lecturer in Physical Geography at St Anne's College, Oxford University. His background is in the physical side of geography but his interests span the entire subject. His academic role is supplemented by his work as an environmental consultant and freelance author having written more than 250 articles in journals, magazines and newspapers, and 18 books.